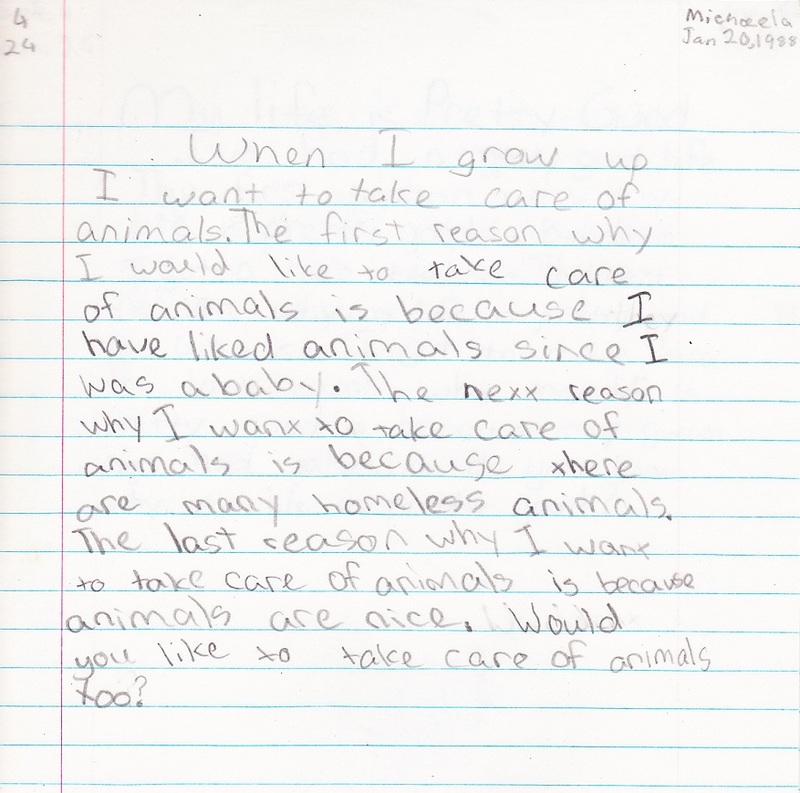 Michaela, do you remember this page from your third grade school journal? I posted it on my personal facebook a couple of days ago. You will be happy to know that I often post links to animals who are in the shelter, in need or homes, or in need of help some other way. There are some people who get annoyed, probably not so much with the fact that I post about animals in need, but just the fact that I post so often! So I posted this journal of yours and told people that if you were here, you’d be posting about those animals also. I got a lot of replies, all of them positive, but this one really touched me. It’s from Turtle … I know you remember her. She’s all grown up and calls herself Kate now, but I am sure you will remember her nickname best, because that’s what you always called her when you talked about her. Anyway, I just wanted to put it here in your blog, so if you are out there somewhere, you can read it, too. Wherever you are, whatever has happened, whatever you have gone through, you are still special, and incredible and gifted. Nobody could ever take that away from you. You are a gift, and you have touched the world immensely. There is no way to possibly tell you how very loved you are, not only by me, by your family, by the friends who knew you, but by a thousand strangers who never knew you. I love you forever, baby girl. I miss you. Is Michaela Alive? What did she say about this? I just want to say, I really like this post. It's so important to let people know how special they are. From your dedication to Michaela, it's clear you let her know how special she is and I bet she remembers that. Such a special girl. I've said it before, and I will say it again – if she is alive, if there is any time other than the first few days that she could be found, this is it. The technology, and social networking makes it so easy for anyone to contact anyone else even with the smallest of detail. The world has shrunk, and with that, distances – physical and mental are reduced too. I think the “headed home” email is a signal…- Abby. Did they ever find out who the young woman on Garridos printing for less card was? I assumed it was a stock picture, but I don't actually know the answer to that question. I'll ask my detective. initially it was reported by the media that the girl in garrido's printing for less card was jaycee but now we know that it's not because jaycee doesn't look like that.i think it was just a professional model. What a caring and loving child! Yes, Michaela is loved even by those who never knew her. Thank you for sharing her letter, Sharon. Praying everyday for the one lead that will bring her back to her family. Abby,anybody with a reasonably sane mind would think that “The technology, and social networking makes it so easy for anyone to contact anyone else even with the smallest of detail” especially in a country like america (we're not talking about somalia or rwanda for God's sake).but guess what,that's apparently not the case.take the advocate lead for example.and i know that sharon has answered this question like a gazillion times before and she must frankly be aggravated listening to another one of her readers talk about this again and i apologize for that sharon.but i have to say this.i purchased a prepaid cell phone at bestbuy during thanksgiving a couple of years ago and before they would let me do it they asked for my driver's license and my social and i'm assuming that the prepaid phone that this advocate lady used to call detective rob lampkin must have been registered in somebody's name and address.is it so hard to track down who that person was and find out who was using that cell phone on the day and time that the call was made? it just seems ridiculous.i'm sorry,i don't mean to make anyone mad here but i just don't get it.unless that advocate lady had something to do with michaela why would a random person call in and say things about michaela as if she knew where she was.it is clues like this that detectives and neighbors deemed insignificant that led to jaycee spending 18 years in captivity.once again my apologies to everyone that i made angry.sorry,i just couldn't hold it in any longer. Evelyn, you can pick up a prepaid cell phone off the rack at Safeway, and I know those people at the checkout aren't checking your license or asking for your social security car.The bottom line is that our investigator is not stupid, and he cares very deeply about this case, and he obviously has tried to trace this or we wouldn't know what we know, would we? It's not as though the advocate said, “Oh by the way, this is a prepaid cell and you can't trace it so don't try,” and the detective said, “Oh, okay, thanks for letting me know that.” Obviously, we tried.And why would a random person call in and say things like that? WHO KNOWS? But they do,and they have, numerous times. We've even had people call and pretend to be Michaela. Oh, and yes, we have tracked them down, and they weren't. So you tell me why, but believe me, it's not unusual. I haven't had to say anything to any of them. One was just a voicemail message left on some stranger's machine, and one was a young girl that the police had a talk with.